Unlike Band Forming centerpieces, Synthetic Boundary centerpieces have very small capillary channels for transferring fluid from the reference (left) to the sample (right) channel. These tiny channels ensure that the fluid transfer is very slow. This gentle transfer, which occurs at higher velocities, avoids disturbing the boundary between the two fluids and produces a sharply defined boundary. Assemble the cell assembly (download assembly instructions). 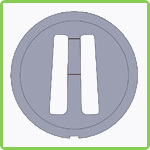 Install fill hole gaskets and fill-hole screws.